*Headform face covers in male version that fits either style styro-foam mannequin wig heads (man or woman). They're already made up with a man or woman's dummy face for an easier way towards a more realistic look! ***Can also be used with our HH-MR-VA236 life sized dummy for a greater sense of realism. 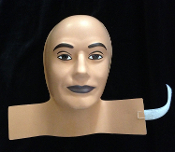 Life-like flesh-tone painted plastic mask cover. Approx. 10.5-inches (26.25cm) high x 12-inches (30cm) wide at neck x 6-inches (15cm) wide at the face x 4.5-inches (11.25cm) deep.